There is a new urgency to the case of the Saudi Arabian blogger imprisoned for publishing his unapproved thoughts because last week the Saudi Arabian Supreme Court upheld the horrid sentence of 10 years in prison and 1000 lashes by a whip or a cane. The judicial system in Saudi Arabia has not officially stated what will happen next, but the very real possibility is that on Friday Mr. Badawi will once again be a part of the public parade of prisoners in Jeddah and his next flogging will occur. The sentence specifies that his 1000 lashes be meted out in sets of 50 each Friday until they are completed. On January 9, the first set was delivered, and the result was that prison doctors declared that his injuries were so severe that the next round of 50 had to be suspended. His case has sat in a suspended state since. With the court’s decision this week, it is more than feared, it is assumed, that the caning will resume this week. The Saudi embassy in Washington, DC, is not answering every phone call placed to it today, perhaps because there are so many coming in regarding this matter. Amnesty International launched an emergency action telephone campaign in which it requested that people volunteer and call the embassy. I participated. I did not get a live human when I called the Saudi embassy—(202) 342-3800, press 2 for English, then 0 for operator. Some callers are reporting online that they are getting through, though. They report that they are being received with politeness but nothing more. If you should decide to participate and call the Saudi Embassy, Amnesty offers this script in case someone answers the phone: “My name is [first name], and I am profoundly disturbed by the flogging of Raif Badawi. Flogging is a flagrant violation of the prohibition on torture and other cruel, inhuman or degrading punishment in international law. I urge you to prevent any future flogging of Raif Badawi and to release him immediately and unconditionally.” Amnesty also has a brief form to fill out to describe the effort: Action for Raif Badawi. I would also like to hear from anyone who calls this week, if you would like to leave a comment below. I am not affiliated in any way with Amnesty International or Raif Badawi’s family. When I last spoke to my husband, he told me something I won’t forget. He told me not to expect him home in the near future. On Sunday, we learned that Saudi Arabia’s Supreme Court made the decision to uphold my husband Raif Badawi’s sentence—10 years in prison and 1,000 lashes, to which he was sentenced for blogging. Take action for my husband: Please help me prevent him from being flogged this Friday. Call the Saudi embassy today. The court’s decision terrifies me. It means that Raif will not only stay behind bars thousands of miles away from us—his family—but also that he might be flogged again as soon as this Friday. Though he hasn’t been flogged since January 9, his sentence states that he is set to endure 950 more lashes over the span of 19 agonizing weeks. Free people like you have done so much to mobilize on Raif’s behalf. Raif asks about you and the protests you’ve organized nearly every time I speak with him. I’m asking you now to continue to raise your voice. It’s in moments like these that the Saudi authorities need to truly feel the pressure from dedicated activists like you. Please call the Saudi embassy today to ask that Raif be unconditionally released. Raif taught me to hang on, to be resilient and to continue fighting for his release. Though it is difficult in these moments, I know that these moments are the most important ones. P.S. Please call the Saudi embassy in Washington D.C. at (202) 342-3800. Press 2 for English, then 0 for the operator. Ask embassy officials to act urgently to see that Raif Badawi is not flogged, and that he is immediately and unconditionally freed. You can also mention that flogging is a violation of international law. Love takes many different shapes and travels many different roads. Love of family. Love between two who believe each to be the other’s everything. Love of truth and of truth-telling, no matter the price. There are individuals around the world who are in prison cells right now, or are being secretly executed right now, because they told the truth about the power arrangements in their nation and told the world that they live in a country that believes in punishing and sometimes killing those who have revealed these things. And yet they have gone ahead and written these things anyway at the risk of joining the ranks of the punished, joining the silent brigades of the killed. This is a love for the truth that I sincerely believe will never be tested in my heart in my lifetime, so I have no clue if I will ever have an opportunity to display the matchless courage that Raif Badawi, his powerhouse wife Ensaf Haidar, his brother-in-law Waleed Abulkhair, or Waleed’s wife (and Raif’s sister) Samar Badawi display every damn day that Raif spends in jail (as of today, 1109 days) and Waleed spends in jail (more than a year now). Raif is a blogger in Saudi Arabia who wrote things like the quote memorialized in the image at the top; his writing plunged him into a Kafka-like dreamworld of religion-as-part-of-state-bureaucracy. For a time, he was charged with apostasy, or renouncing his religion. The punishment for apostasy is a beheading. Instead, he was declared guilty of a lesser charge, “insulting” his nation’s official state religion. That landed him a sentence of 10 years in jail and 1000 lashes by a whip or a cane, to be delivered in sets of 50 slashes each Friday before Friday prayers. The first set of 50 was delivered on January 9, and his condition has been reported to be too weak to withstand a second set each Friday since. Waleed is Raif’s brother-in-law and his lawyer and a human rights activist. He was arrested in the courtroom during a hearing regarding his own case and summarily found guilty and given a sentence of 15 years in jail. Ensaf Haidar spent the last couple weeks in Europe meeting with government agencies and diplomats, and she accepted awards in the name of her imprisoned husband. 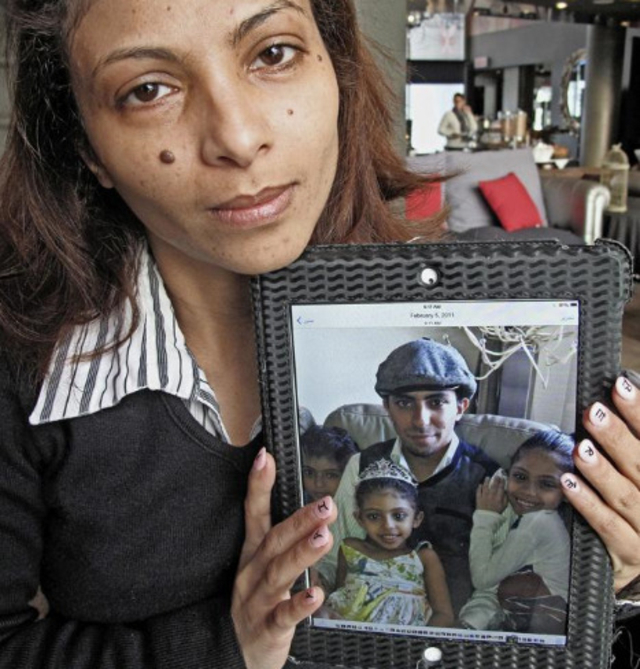 She is trying to get any government to directly address the Saudi government specifically about her husband’s case. So far, embassies have delivered messages to embassies. Statements have been given to the press. “I’m not aware of any government talking officially to the Saudi Arabian authorities and officially requesting the release of Raif,” she toldThe Independent last week. She is working to inspire that sort of direct communication. On May 21, Amnesty International gave Joan Baez and Ai Weiwei the organization’s prestigious Ambassador of Conscience award in Berlin. Ensaf was there and delivered a speech. She was embraced by Patti Smith. That is love, too. Love that is neither requested not required when two people join together, but a precious love when it is seen. I wrote last week, “Building a family is perhaps the most optimistic act possible; fighting for a better country and world demands vigilance in the name of that optimism.” The two have three young children, ages 11, 10, and seven. They have only seen photos of their father in the last three years as well. And so she fights. She is not alone, but meeting hundreds of supporters and seeing thousands of signatures probably can not keep her and her family from the dread-filled feeling that this nightmare is theirs alone for the entire 24 hours each day. Today, June 1, is Backlash Day. If you are following this story, you are seeing Amnesty yellow online everywhere, like above. The organizers of the websiteRaifBadawi.org(full disclosure: two of my columns about this story have been included on the website) have organized a Facebook- and Twitter-storm to create and direct attention against Saudi censorship. 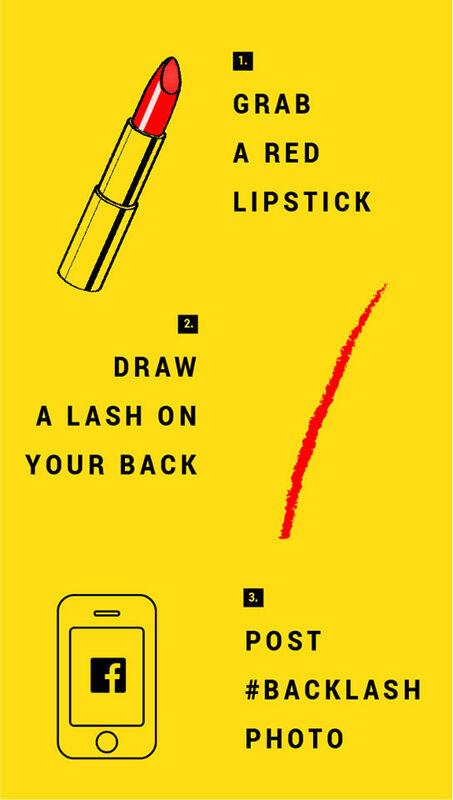 They are calling for people to post photos of themselves with a red lipstick slash drawn across their naked back—as if they have been whipped—with the hashtag #backlash. So far today, I have seen dozens of these photos. The group describes the movement as “A multi-faith, multi-ethnic #backlash on behalf of those that do not have liberty or freedom of expression.” I do not think this movement will stop just because June 2 will follow June 1. It will continue. Why this story? Why am I spending the capital of my reputation on this story? Raif Badawi’s story is one about injustice, about the idea that a person can face corporal and capital punishment for possessing ideas and for writing them down and publishing them, and his story also represents one that is being seen too often, in too many places around the world. His country is Saudi Arabia, and as a citizen of the United States, I am aware that I have no say in the legal system or traditions of another country’s bureaucracy; I can only write this column to implore my government to at least say something to one of its allies in the name of a fellow writer and the freedom of ideas. So far, officially, it has not. I can only write and publish this to add to the sound of millions demanding justice. It is not a pleasant sound, but it is a sweet one. The humanitarian outcry and the many statements from diplomats of other countries about this story do not get the attention of the authorities in Saudi Arabia simply because there would be very little backing up those statements. We need our ally more than it needs our approval; our disapproval means little. So why make an empty statement that will be received with an empty statement? To not try, though, that is horrifying. And the authorities in Saudi Arabia can point to stories in which American writers and journalists in other countries that are decrying Badawi’s treatment have been jailed or face jail time for the crime of writing, so they feel that they can tell us to stick it. I know that I write andcomplain…about them…a lot. I do not face harassment for writing my opinions. I cherish this fact. Attention must be paid to all of these cases, here in America and abroad. Attention must be paid. FollowThe Gad About Townon Facebook! Subscribe today for daily facts (well, trivia) about literature and history, plus links to other writers on Facebook.